As said in a previous post, I’m kind of enamoured with peated whisky from a port cask. Whether it’s a finish or a maturation doesn’t really matter to me, as long as the cask doesn’t fully overpower the whisky. How much like it depends on the quality of both the whisky and the casks of course. In the case of Longrow I at least know that the quality of the whisky is taken care of. I love that stuff, unless they finish it in a Tokaji cask. They’re fairly consistent although they sometimes mislabel a Longrow as a Springbank (I think). In this case they decided to put their newest Red release straight in my current area of interest. Their previous releases were from red wine casks and even though those usually raise my skepticism they were both pretty okay. Let’s see how this one fares! I generally don’t comment on the color of a dram since it usually doesn’t mean anything, with the creative wood management that currently exists, but this one is definitely of a pink/orange hue. Pretty heavy with some nuts, smoke and an earthy scent to it, like mushrooms, or wet leaves. Slightly salty with cigar smoke and a hint of red fruits behind that. More timid than I expected. The palate has two faces. There is a sharp, slightly salty side to it, with some barley and smoke. The other side has the warmth of the fruits, the dark oak and port like flavors. It blends rather well after a couple of seconds, but it seems the peppery bite is getting a tad overpowering. The finish is definitely smoky with fresh wood smoke, but also some cigars. Some stewed red fruits (strawberries mostly), with oak, peat and that earthy flavor I also found on the nose. While this might not be the most complicated of drams, it sure is a tasty one. I love the combination of fruit, smoke and warmth it gives, and I think Springbank has timed the release of this bottle well, since we’re heading for some colder months now. 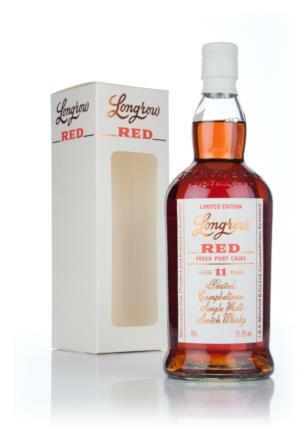 Longrow Red 2014, Fresh Port Casks, 51.8%. Pretty easy to get at the moment but I suggest trying a local specialty shop. Drinks & Gifts has it, so does De Whiskykoning. Master of Malt stocks it too, but the exchange rate for the Pound Sterling does you in, if you’re used to Euros. In The Netherlands it should be between € 60 and € 65, and it’s well worth it! This entry was posted in Longrow, Springbank and tagged Bottle Share, Campbeltown, Longrow, Port & Peat, Port Cask, Springbank. Bookmark the permalink.